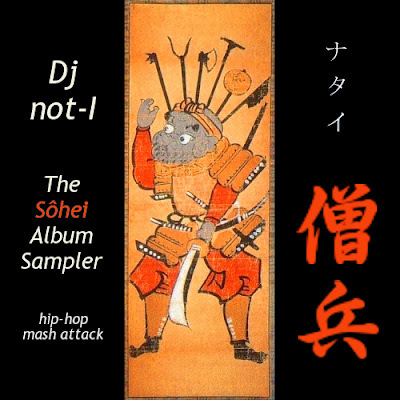 The Sōhei Album Sampler - "Hip-Hop Mash Attack." 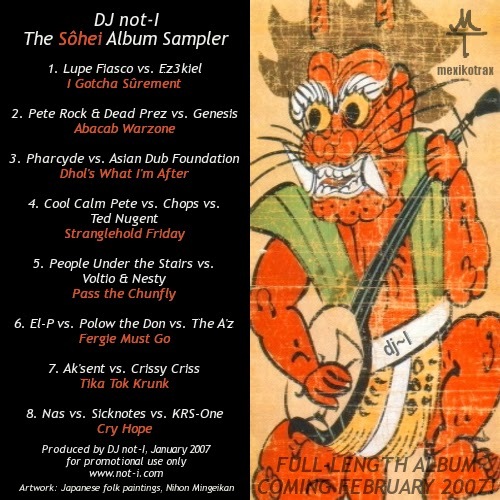 Full of vigor, hip-hop sensibilities, and "fighting spirit" and produced almost entirely from vinyl sources, this was my first attempt at a proper album, which turned out as an EP-length "album sampler." Started in late 2006 and released in January 2007, these songs actually preceded those of Collected Mashups Vol. 2a. I am still quite proud of them. The sampler includes the internet hits: "Fergie Must Go," "Pass The Chunfly," and "Stranglehold Friday". Originally, I had planned to release an entire CD-length work called The Sōhei Album. Many of the songs I had intended to include were gradually released as singles, though several unreleased tracks in various states of completion still remain on my old hard drive . The Collected Mashups series will eventually feature them as well, perhaps as the last volume. I offer this long-unavailable EP as Vol. 2b in the series. I hope you enjoy it!